We are used to having play dates for our children, but what about us moms? Thinking about having a paint night out with the girls? 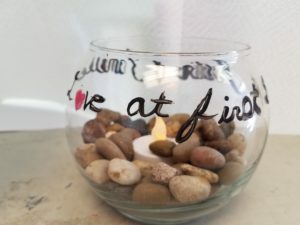 Instead of paying money for an expensive night out, stay in and create your own with this decorate glass bowl activity. It’s simple and easy, so you can even do it while the kids are playing. All the items used were from the dollar store. Set up: Place a variety of acrylic paints on the table. You can print out some stain glass templates for tracing. You can also print nice quotes or popular sayings for tracing. You can even type out your own words in a word or publisher document and print them out on paper for tracing. The best way to trace, is to tape the paper to the inside of the bowl. Get it as flat against the glass as you can. 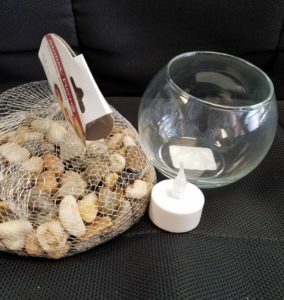 Prep the bowls by cleaning the inside and outside with rubbing alcohol. Step 1. Give each guest a glass bowl. Step 2: Let your guests paint a design on the bowl. If using a template, tape it to the inside of the glass so it stays in place. Make your it is completely flat against the class. 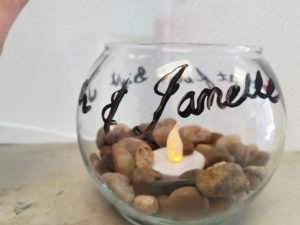 You can also leave paper out in case guests would like to draw their design on paper before painting it on the glass. On mine I printed out love at first sight and my kids names. 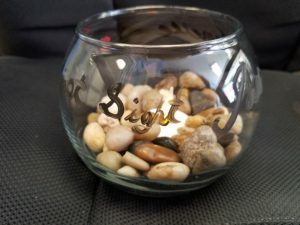 I taped them to the inside of my bowl and painted over the letters with a thin paint brush. I recommend getting fine tip brushes, it makes it easier to trace. It will help to have a couple different brush sizes. I do not recommend using the cheap brushes that come with the water color sets. They tips are flimsy, which makes it harder to paint on the glass. 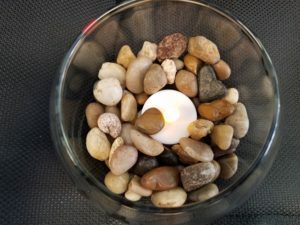 Step 3: When the outside of the bowl is try, have your guest add their candle and then aquarium rocks. You can substitute rocks for sand or you can use both. When your guests are finished they will have a nice decoration for their home or office. 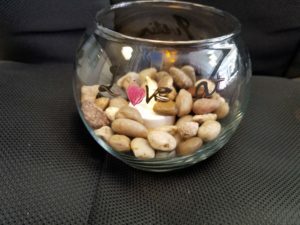 It cost me a total of $9 for each of my 5 friends to make this cute decorate glass bowl candle holder. It cost another $13 to purchase 6 acrylic paints and paint brushes. A total of $22 for a small group of friends to together and have a fun night. Each of us brought a snack and adult beverage. It was a great night.